A PERSONAL ORGANIZER, day planner, personal analog assistant, or personal planner is a small book/binder, designed to be portable, usually containing a diary, calendar, address book, and other sections usually including blank paper. It may also include pages with useful information, such as maps, telephone codes. It is related to the separate desktop stationery items that have one or more of the same functions, such as appointment calendars, rolodexes, notebooks, and almanacs. For some the function of paper-and-binder personal organizers, a 20th century innovation, is being assumed by electronic personal digital assistants (PDAs) and personal information manager software on personal computers. Some personal organizers attempt to bridge the gap by featuring holders for PDAs. a diary is the only thing you need to keep this year - The Telegraph. Bullet Journal - "The Analog Method for the Digital Age." Gold standard: Smythson's personalisation service - The Telegraph. Gratitude Journal - "Rewire your brain in just 5 minutes a day." Gratitude Journal iPhone app. As seen on USA Today, Forbes, Oprah, and NPR. Write down 5 things you're grateful for each day, and you will rewire your brain, changing your life forever. Moleskine - since 1997. "Moleskine is a brand that encompasses a family of nomadic objects: notebooks, diaries, journals, bags, writing instruments and reading accessories, dedicated to our mobile identity. Flexible and brilliantly simple tools for use both in everyday and extraordinary circumstances, ultimately becoming an integral part of our personality." Moleskine’s smart planner requires too much effort - engadget. perpetual disappointments diary - Asbury & Asbury. The Benefits of a Gratitude Journal & How to Maintain One - The Huffington Post. The Case for Using a Paper Planner - The New York Times. Tips for Keeping a Gratitude Journal - Greater Good. The Science of a Meaningful Life. Why men should keep a journal - The Guardian. ANYA HINDMARCH - since 1987. Women's journals. ASPINAL OF LONDON - since 2000. Personalised luxury leather organisers. CARAN D'ACHE - since 1915. Men's pocket organiser. Cartier - since 1847. Must de Cartier desk diaries & refills. 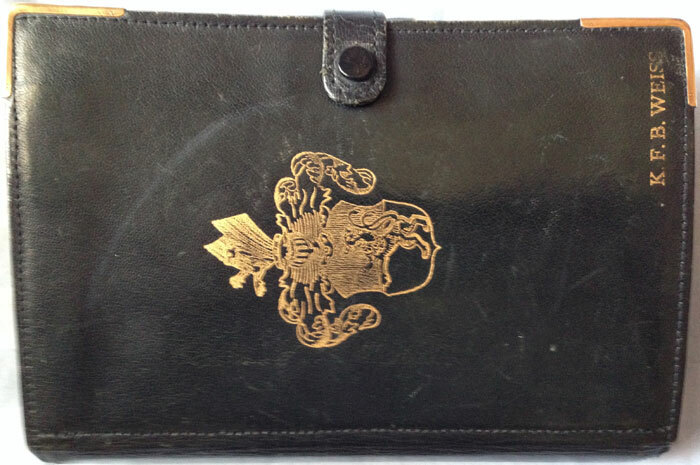 FILOFAX - founded 1921. "It's a way of life." 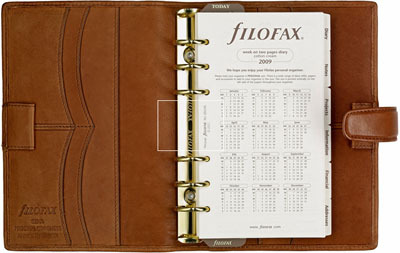 A flexible approach to staying organized - a Filofax organizer is as individual as you are. With contemporary and classic designs, an array of colors and sizes, and luxury leather, fabric or leather-look styles - you won’t find a wider range of organizers anywhere else. FRANKLIN COVEY - since 1997. Leather organizer. HERMÈS - since 1837. Men's & women's agendas & refills. Letts - since 1812. "The Original Diary." All models. Louis Vuitton Desk Agenda - since 1854. "Designed to stay on the desk, this spacious leather-lined agenda in Monogram canvas provides an elegant holder for notes and small papers. Desk Agenda refills and address book available separately." Louis Vuitton LARGE RING AGENDA - since 1854. "This large agenda cover in Taiga leather six-ring binder, separated into two groups of three, credit card slots, several compartments. Agenda refill available separately." Lucrin Geneva - founded in Switzerland in 1994. "Organize your way to success." Collection of leather organisers available in 2 models: medium (14×20 cm) and the large (18×25 cm). They are designed with a flat pocket and several slits for credit cards or business cards, as well as a slot for your pen. The refills from the World Time brand are well-known for their practicability and the well-designed annexes (phone directory, meetings, cards, notes and schema, ...). Millican - since 2008. Matt the Moleskine cover. MOLESKINE - since 1997. "Legendary notebooks." Diaries, notebooks, journals & planners. 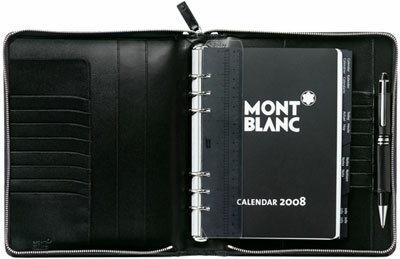 MONTBLANC - since 1906. Organisers & agendas. MULBERRY - since 1971. Organisers & notebooks. OMEGA - since 1848. All models. PINEIDER - since 1774. Diaries & organizers. PINETTI - since 1970. "Handmade in Italy." 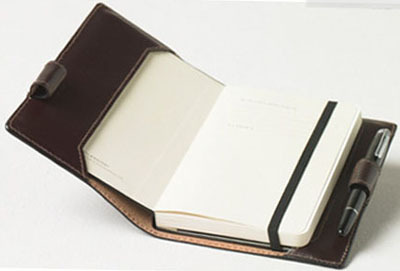 Calf leather, removable leather cover, 144 pages, refill notebook, 144 white pages. Quotus - Italian luxury leatherbound handmade weekly planners. SASCO PLANNERS - "Wall Mpounted Year Calendars." SMYTHSON OF BOND STREET - since 1887. "Over 125 Years of British Luxury." 2019 Diaries and Organisers. Discover your new luxury leather 2019 Diary, handcrafted with our iconic pale blue Featherweight paper. TIME MANAGER - since 1975. "The Time Manager comes in 5 models, from Companion, the smallest, through Compact, Golden Line, Original size and A5, which is the largest."